Fishing is big business all year in Ludington. There are numerous places for anglers to try their luck, and Ludington has such a great variety of fish. Some of the best charter captains on Lake Michigan make Ludington their home port, and will happily take people out on the lake to fish for salmon and trout. launch the spring season with steelhead catches in the Pere Marquette River and suckers that are plentiful from the crossroads and bridges. The cool nights of April bring smelt dippers out with their lights and nets to bring in bucket loads of the silvery fish. Late April kicks off the walleye, northern pike, muskie and trout season. Brook, rainbow, and brown trout are ready for the catching in the Pere Marquette River and along the Lake Michigan shoreline. are great for charter fishing as brown trout, lake trout and some salmon and steelhead are prevalent. Fly fishing on the Pere Marquette River during this time of year is excellent. June is the time for perch fishing along the rocky waters off the Consumers Power Plant and on the inland lakes of Hamlin, Lincoln and Pere Marquette. This is also the season for fine crappie and pike fishing on the inland lakes. are King salmon months and action is fast and furious. Charter boats often angle for salmon in the morning then move offshore to reel in a few steelhead to throw on the grill as well. 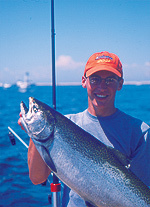 Many charter captains and diehard fishermen flock to Ludington for the Ludington Offshore tournament in mid-July. It's one of the most popular fishing tournaments on Lake Michigan, with over $100,000 in cash and prizes. Charter fishing is still big business going into the fall. September is the month when thousands of mature salmon and steelhead mass off the river mouths for their annual migration upstream. On the inland lakes, crappie, bluegill, and small mouth bass fishing are excellent. brings steelhead catches on the Pere Marquette River, where guides or charter captains can help you find the prime fishing spots. These jumpers are lively and, with minimal boat traffic at this time of year, the catches are even better for anglers. During the autumn steelhead and Salmon Runs, anglers line the banks of the Big Sable River which courses through the Ludington State Park. These fish jumping over the Hamlin Dam is a sight to see! This mile-long stretch from Hamlin Lake is a favorite as the catches are definitely worth writing home about. Once the ice freezes in December, venture out onto Hamlin Lake for some bluegill or walleye fishing. January kicks off the northern pike spearing season and Hamlin, Pere Marquette, and Lincoln Lakes offer plenty of action. February and March bring crappie action on Hamlin Lake where perch, walleye, and bluegills also can be found. Fishermen brave the cold for the ice fishing tournament held in early February on Hamlin Lake.